Plumbers, carpet layers, and other people who spend a lot of time on their knees often experience swelling in the front of the knee. 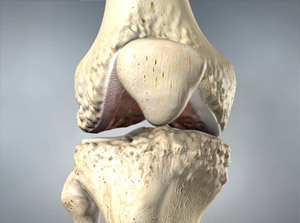 The constant friction irritates a small lubricating sac (bursa) located just in front of the kneecap (patella). The bursa enables the kneecap to move smoothly under the skin. If the bursa becomes inflamed, it fills with fluid and causes swelling at the top of the knee. This condition is called kneecap (prepatellar) bursitis. Rest – Discontinue the activity or substitute another activity until the bursitis clears up. Ice – Apply ice at regular intervals 3 or 4 times a day for 20 minutes at a time. Each session should reduce swelling considerably if the knee is also being rested. Elevation – Elevate the affected leg except when it is necessary to walk. Medication – Take an anti-inflammatory medication such as aspirin or ibuprofen. If the swelling is significant, your physician may decide to drain (aspirate) the bursa with a needle. Chronic swelling that causes disability may also be treated by draining the bursa, but if the swelling continues, your orthopaedic surgeon may recommend surgical removal of the bursa, which is an outpatient procedure. 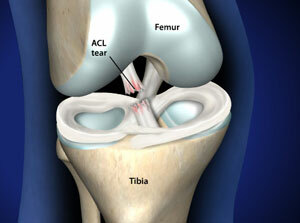 After surgery, the knee should regain its flexibility in a few days and normal activities can be resumed in a few weeks. Wear kneepads if you work on your knees or participate in contact sports such as football, basketball, or wrestling. Rest your knees regularly by stopping to stretch your legs. You may also consider switching activities on a regular basis to avoid prolonged stress on your knees. Apply ice and elevate your knees after a workout.